Obtaining a green card is the dream for those who want to live permanently in the USA. Thousands of people have this dream, but only a handful is able to make successful applications and obtain a green card. The first aspect that you need to think if you want to get this permanent resident ship card is if you are eligible for the green card. There are some criteria that make you Eligible to apply for Green Card. If you are inside US, you should start the adjustment of status process with USCIS. If you are outside the US, you should start the consular processing with the Department of State of US. You are eligible for green card through family if you are a spouse or parent or a child, of a US citizen. You are also eligible to apply if you are a sibling of a US citizen. A fiancé of US citizen can apply through the K-1 nonimmigrant visa. And a child of a fiancé can apply with the K-2 nonimmigrant visa. Widow of US citizens can also apply for naturalization in the US. Any workers who are skilled and have extraordinary skills in the field of arts or science and other disciplines fall in this category. Physicians who are willing to work in needy areas for a specific period are also allowed to apply under the immigrant worker category. You are also eligible to apply for Green card under the immigrant worker category. This is possible if you are willing to invest a minimum of $500,000 in US and your business can employ a minimum of 10 people. You are eligible to apply for a green card as a special immigrant if you are a religious worker. You are also eligible to apply for the permanent resident status if you are an international broadcaster or you are an Iraqi or Afghan national and have served for the US government in those countries. Application for this Alien registration card is possible if you are a member of specific international organizations like the NATO. You can apply for permanent resident status if you were given asylum in the US or if you were a refugee at least one year prior to application date. If you hold a T non immigrant visa (Human trafficking victim) or a U non immigrant visa (Crime victim). Victims of abuse, who are spouses/children/parent of US citizen, are eligible for naturalization in the US. If you are selected for US citizenship under the Diversity Immigrant Visa Program, you are eligible for a green card. If you fall in the category of Cuban Adjustment Act and others under such acts, you are also eligible to apply for the card. 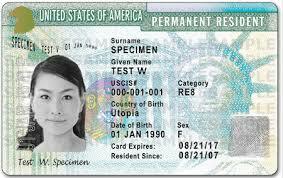 If you have lived in the US from before 1972, then you are also eligible for permanent resident card. There are other factors that will decide if you will be awarded a green card. You have to be resident of US for 5 years before you can apply. You have to have stayed in the United States not less than 5 years. Even a day less than 5 years will not make you eligible to apply for this card. 1. How long is the green card valid? The green card is valid for a minimum of 10 years. 2. What to do when the green card expires? You will have to renew your it. 3. When can you start process of renewal of green card that is about to expire? You can start the process of renewal of your permanent resident card 6 months before it expires. 4. How can the Green card be renewed? You have to file the Form I-90. This is the application that can help you replace the card. This application for renewal of the permanent resident card can be filed online. 5. How long does it take to obtain a green card? The process to obtain US citizenship or naturalization could take a minimum of 4 months, but for some people it could even take up to 3 years. 6. After marriage can I apply for the permanent resident card? If you have married a US citizen, you can apply for the card after 3 years. You should have been having approval of conditional residence. This will make you eligible to apply for the green card. 7. What form is for adjusting status and cost of green card? The form I-485 of the USCIS is the one required for adjusting status. The cost of this is $1055. If you need to have biometric / fingerprinting done, the cost of application is $1140. This is subject to change. This fee also varies with different categories of applications. For example, the Diversity Visa lottery application costs $330.